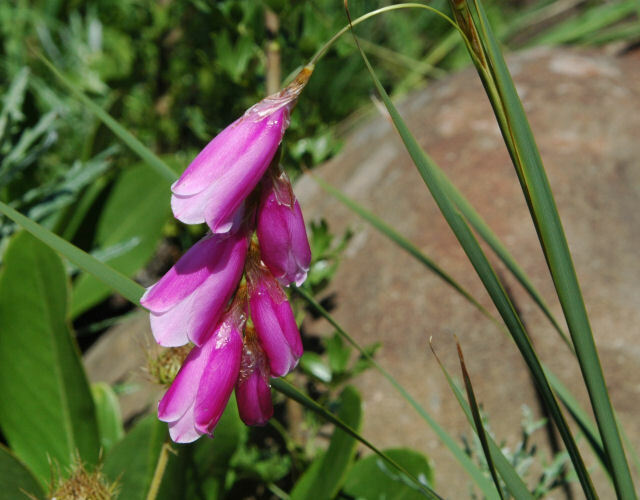 Dierama is an African genus in the Iridaceae family. It is found in sub-Saharan Africa. There are 44 species. 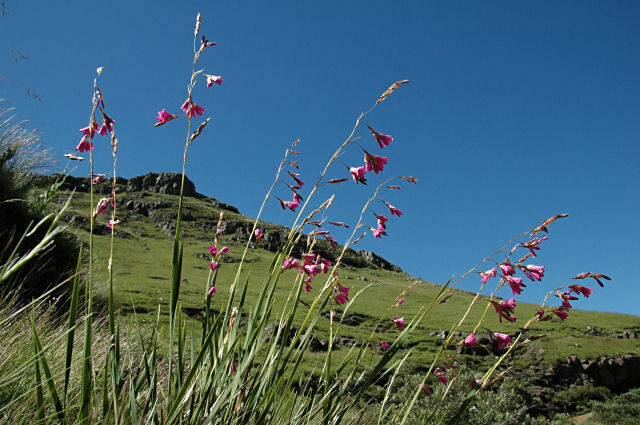 Most are found in the eastern mountainous regions of Southern Africa. 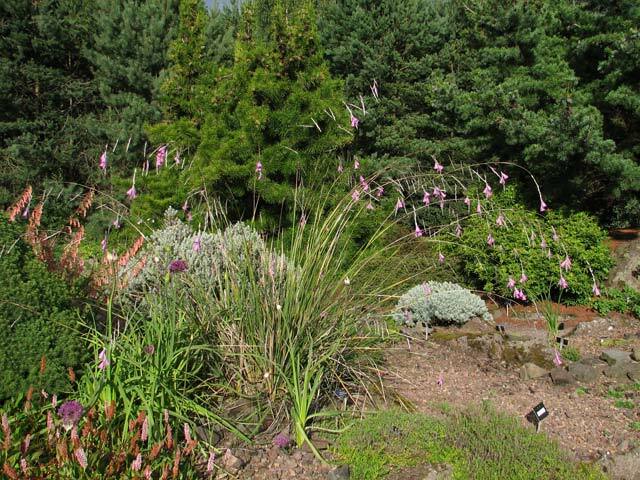 Dierama is an evergreen, mainly summer growing geophyte. 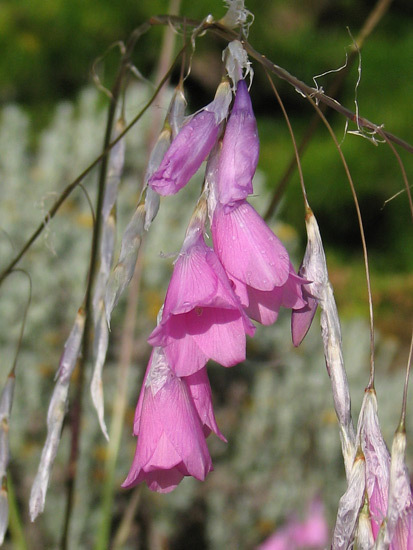 It has long, narrow tough fibrous foliage and pendulous bell-shaped flowers in shades of white, yellow, pink, magenta, mauve or maroon. 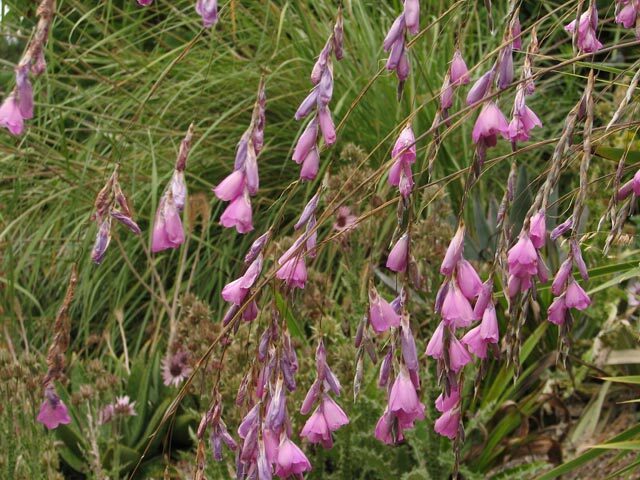 It is recognized by its wiry, usually drooping spikes, and it can be quite dramatic in the garden. 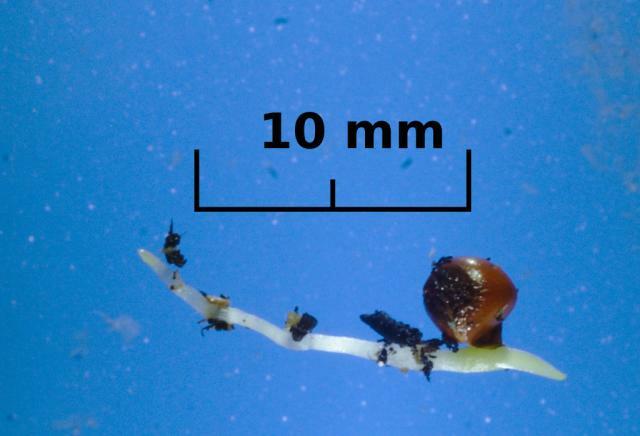 The rootstock is a corm that roots from below with past season corms not always resorbed. 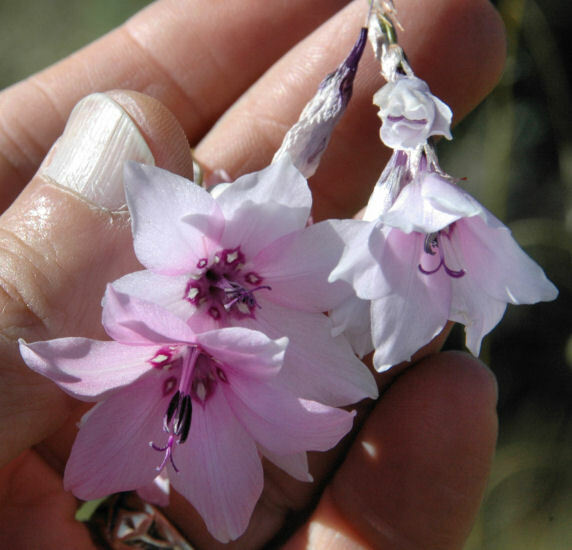 Flowers are pollinated by bees and when in seed the plants are also very striking. 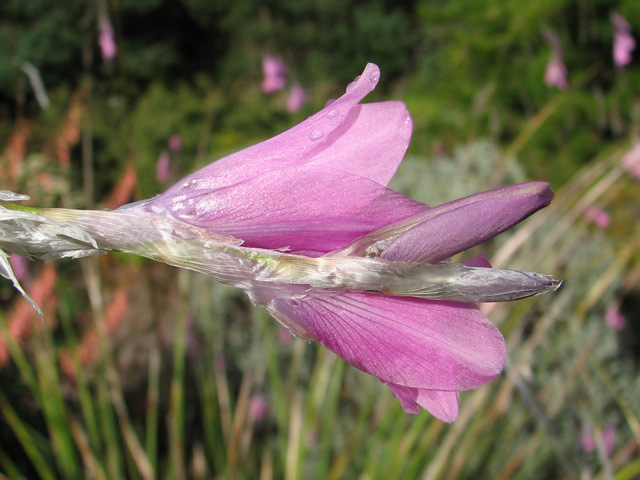 A common name sometimes attached to members of this genus is Fairy Fishing Rod. To grow from seeds, sow the seeds in a well drained mix and cover them with a thin layer of the medium. Some high altitude species may need cold stratification. Generally, sowing during early spring will give the seedlings enough warmth to germinate. While in growth, the seedlings do not like to dry out. Fertilizing occasionally with a dilute fertilizer is beneficial. Seedlings benefit from a deep pot because they send their thickened fleshy roots deep into the pot. 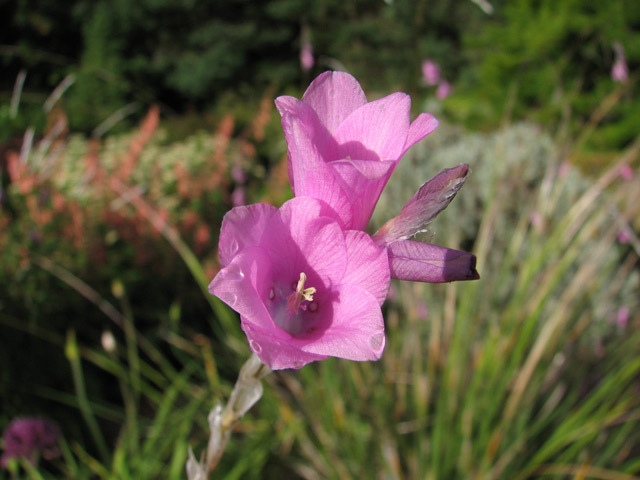 Some species may bloom in a 1 gallon (3L) pot but most do much better in the ground where they have room to spread. 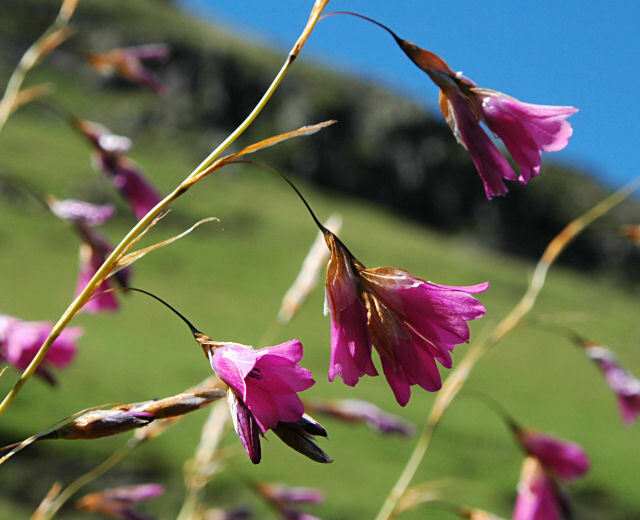 Dierama dracomontanum Hilliard is native to the Drakensberg Mountains of South Africa where it grows in grassland, sometimes dominating mountain slopes. 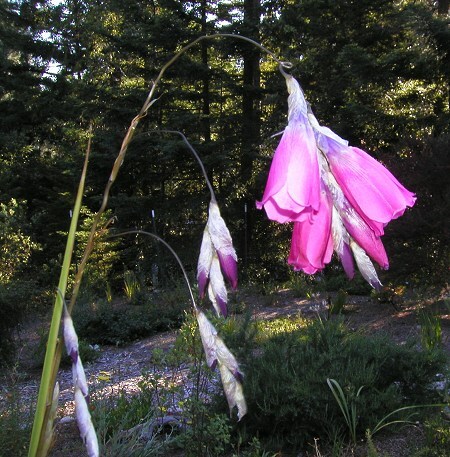 It grows to 1 m and has light to dark rose pink, coral or red, sometimes purple pink flowers. It blooms from November to February. 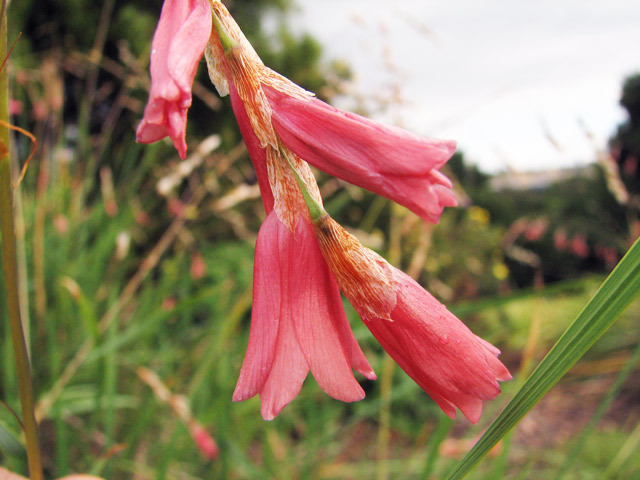 The photos below were taken by Nhu Nguyen from the Royal Botanic Garden, Edinburgh. 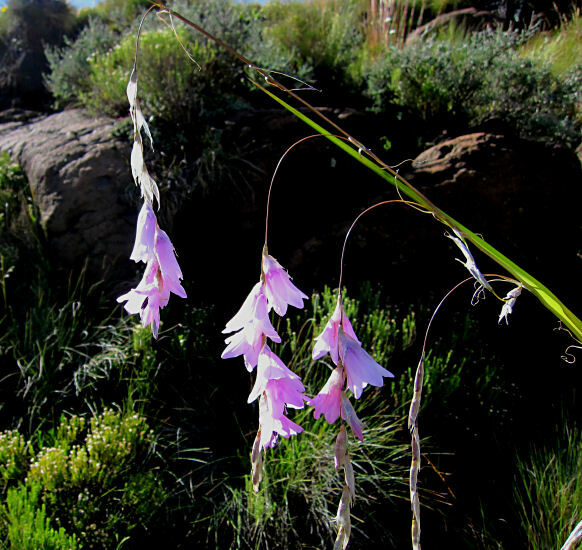 Photos by Cameron McMaster taken in the Eastern Cape at Sentinel Peak. 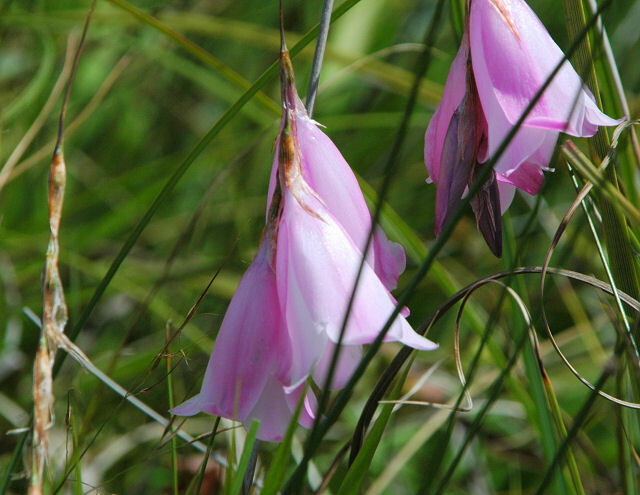 Dierama erectum Hilliard is native to KwaZulu-Natal where it grows in wet grassland near streams. 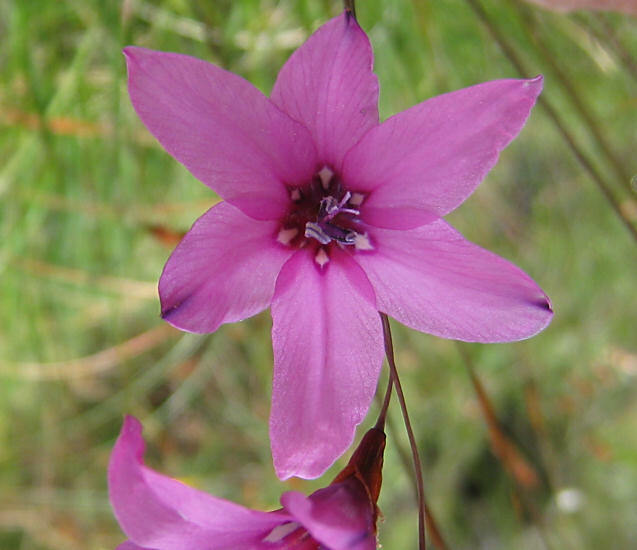 Growing in clumps up to 1.5 m, it has light magenta pink flowers with eyes at the base of each tepal in an erect inflorescence. It flowers in April. Photo from Rod Saunders. 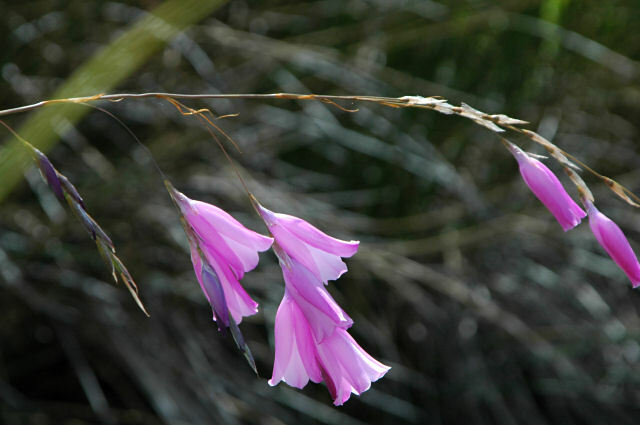 Dierama grandiflorum G.J.Lewis is confined to a small area of the Bosberg near Somerset East. 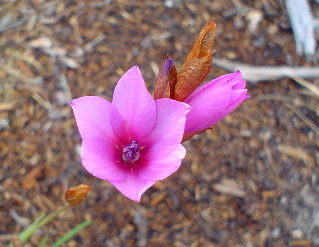 Flowering and photographed in early spring by Rob Hamilton. 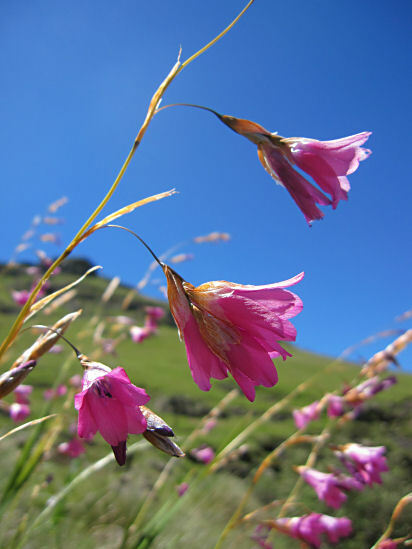 Dierama luteoalbidum I.Verd. 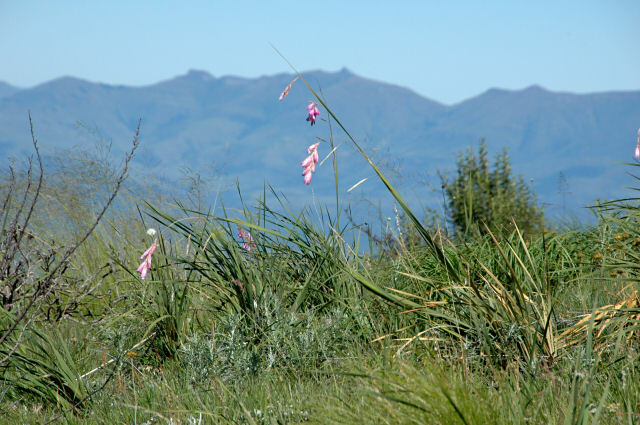 is a rare species that is found in open grassland in the Eastern Cape. 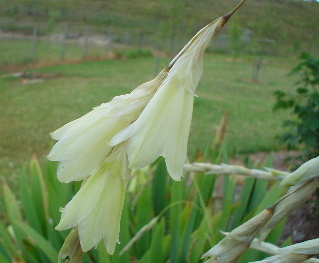 Flowers are a lovely pale lemon colour in bud opening to white shaded yellow. 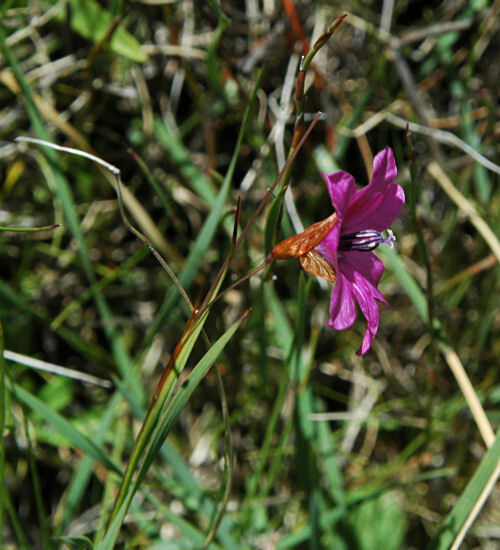 Flowered and photographed in early summer by Rob Hamilton. 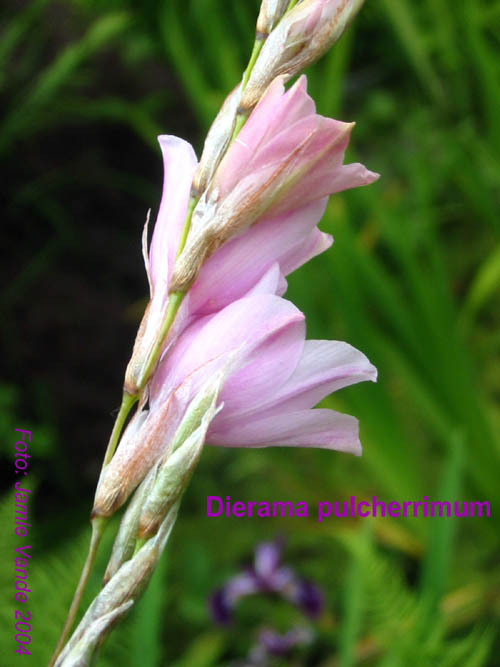 Dierama pauciflorum N.E.Br. 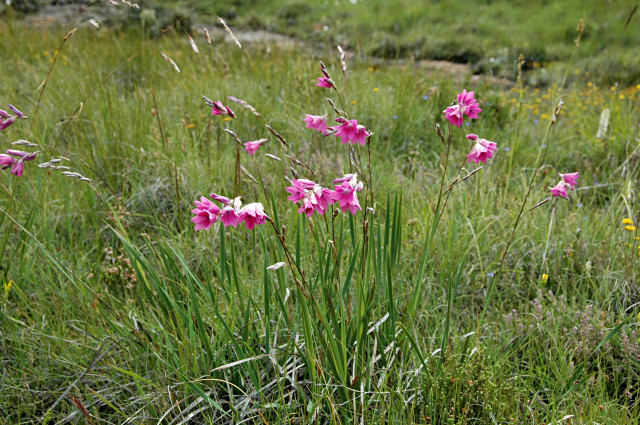 is found in clumps in marshy ground or forming tussocks in water, or singly on drier ground from the Eastern Cape to Zimbabwe. 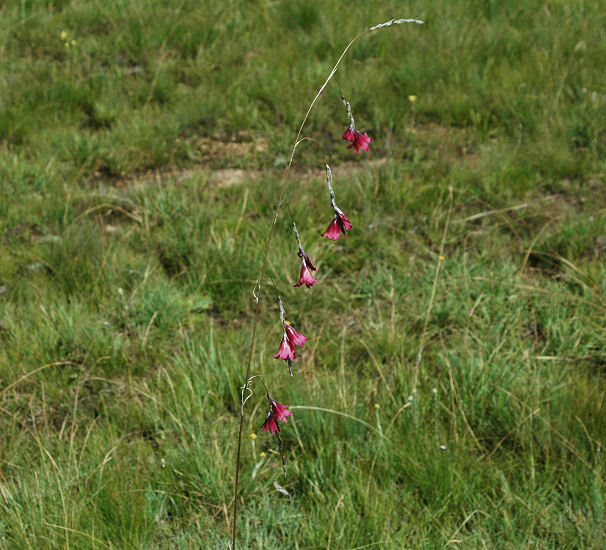 The paucity of flowers on this species is made up by its intense colour (pink to reddish). The first photo was taken by Rob Hamilton in early summer of a plant he is growing. Photos 2-4 from Cameron McMaster, Mary Sue Ittner, and Bob Rutemoeller taken January 2010 at Naude's Nek. 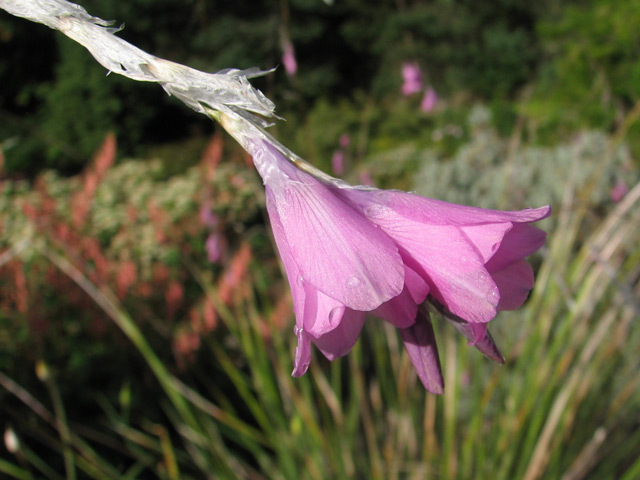 Dierama pendulum (L.f.) Baker is the only member of this genus that is in a winter rainfall area. 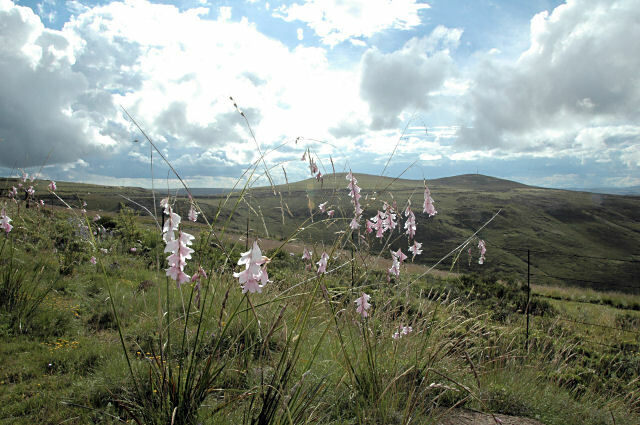 It grows on rocky, loamy clay or sandstone slopes and flats in the southeastern Cape (an area that gets year round rain). 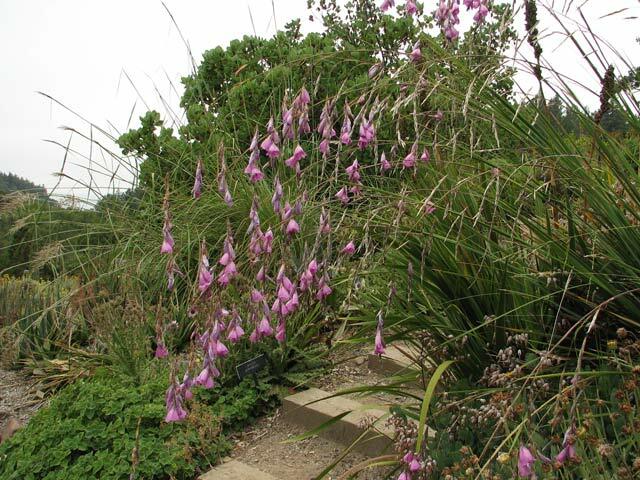 Growing from 70 to 110 cm, with a slender and wiry stem, linear leaves, it has pink nodding flowers in drooping spikes and flowers Oct-Dec. 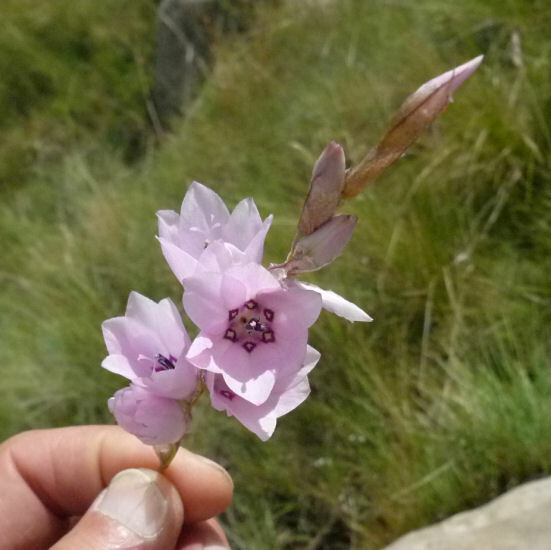 The photo is a white form of this species photographed and flowered by Rob Hamilton in early summer. 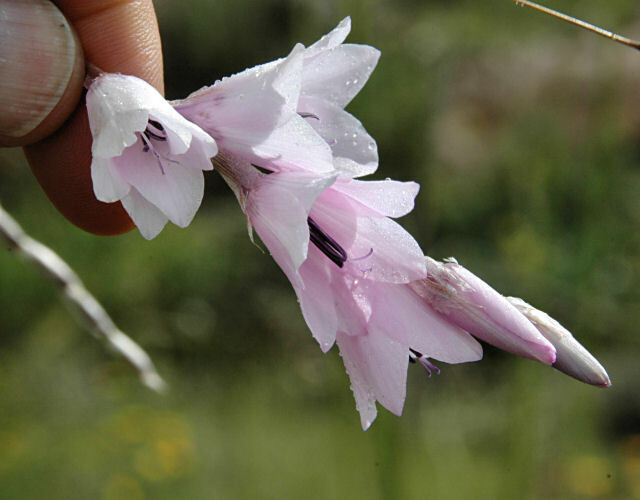 Dierama pulcherrimum (Hook.f.) 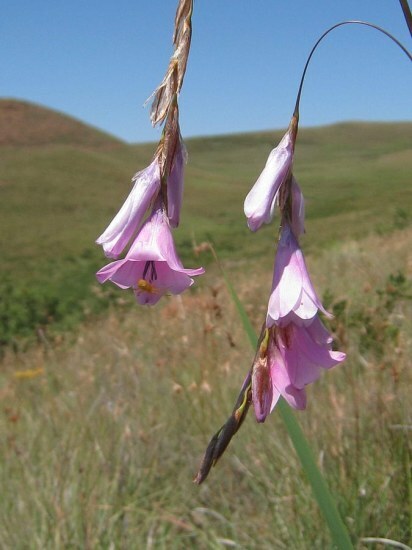 Baker is an Eastern Cape South African species that is more or less evergreen and grows to 1.6 meters in open, stony grassland. 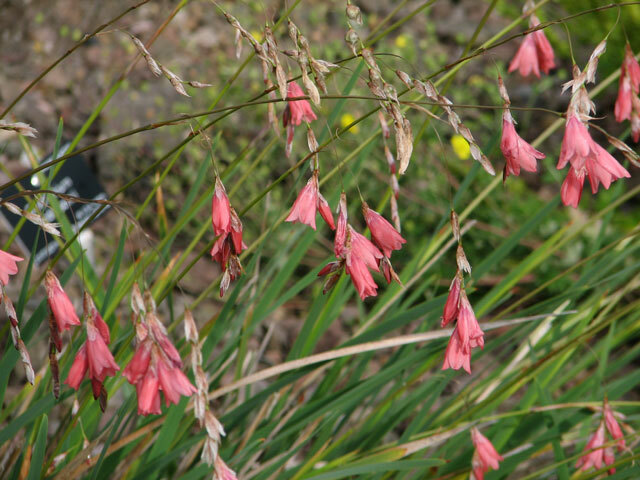 It has magenta pink to reddish purple bell-like flowers on wiry stems. It is summer flowering. 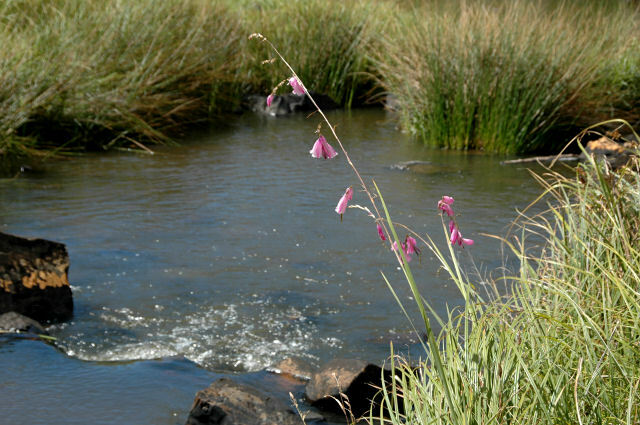 Photos below from Bob Rutemoeller and Mary Sue Ittner taken in the Eastern Cape including Gaika's Kop January 2010. 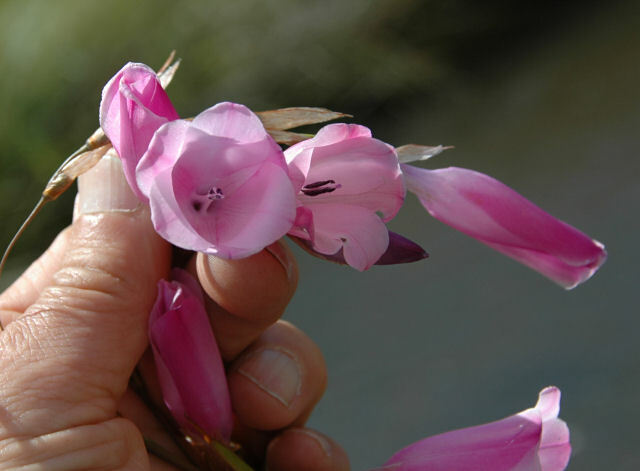 Photos by Nhu Nguyen of a very mature clump at the UC Botanical Garden. 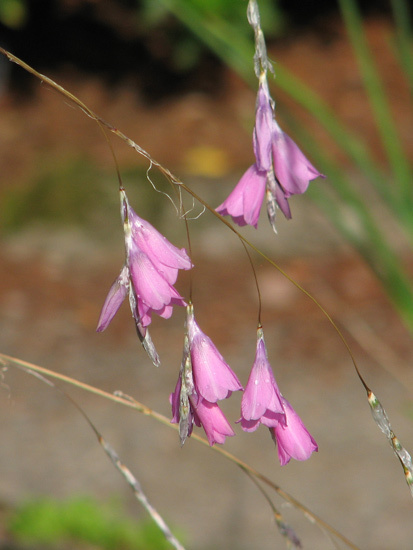 See also Dierama spp. below. 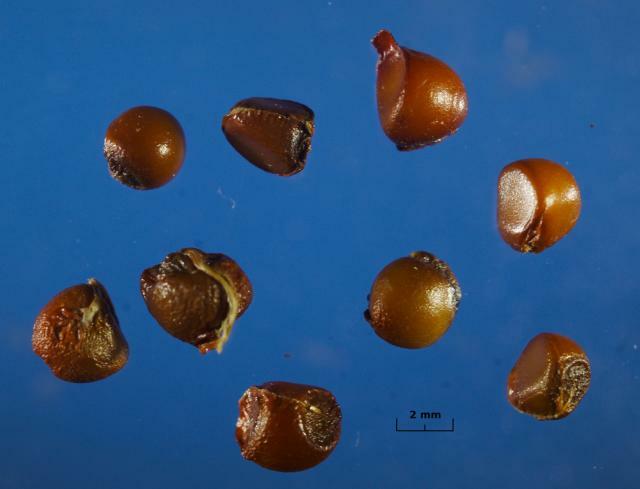 Photographs by David Pilling of seeds and a seedling about two weeks after seed was exposed to moisture at 65 °F. 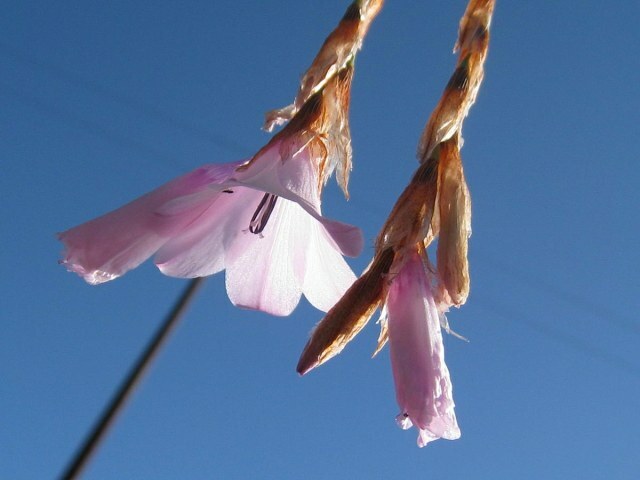 Dierama reynoldsii Verd. 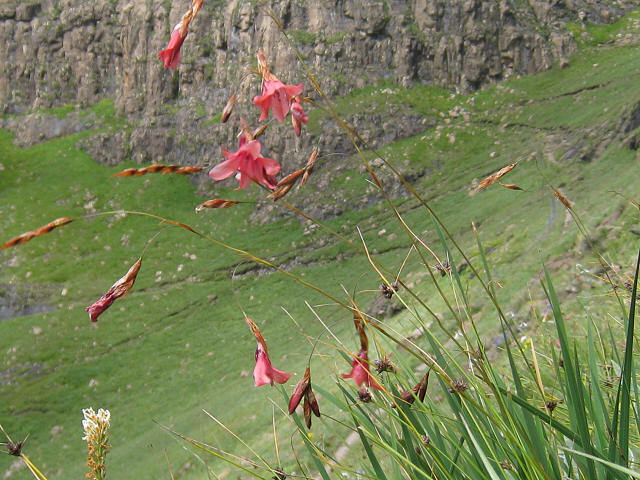 is an eastern Cape and KwaZulu-Natal species with narrow leaves and large red flowers. Photos taken January 2010, Maclear, by Cameron McMaster and Mary Sue Ittner. 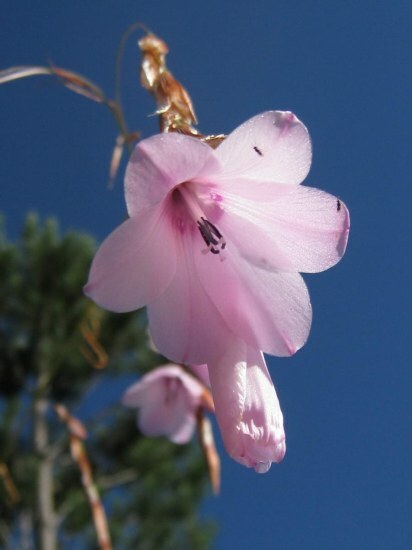 Dierama robustum N.E.Br. 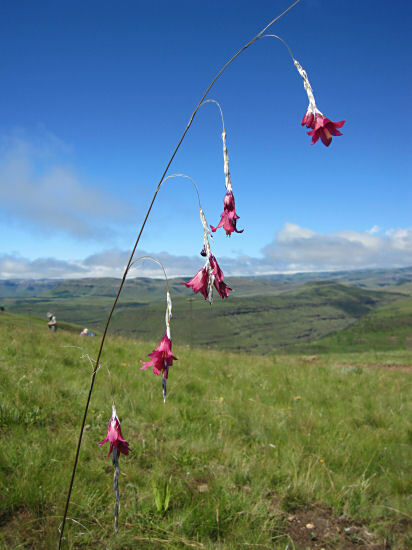 grows from 1 to 2 meters tall and is widespread at high altitudes in grassland in the Eastern Cape and the Drakensberg. 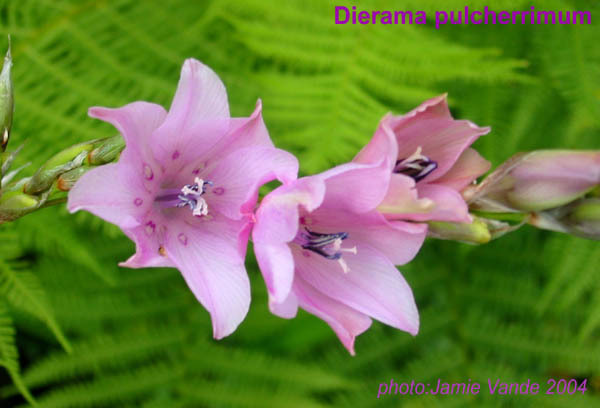 It has pendulous large white to pale pink or mauve flowers and blooms in summer. 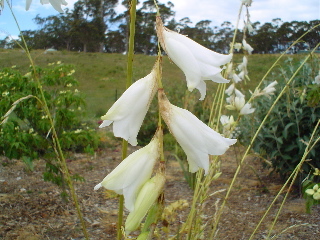 Bracts are whitish heavily flecked brown in upper parts. Photos taken by Cameron McMaster and Bob Rutemoeller. Photos 1-3 taken at Balloch and photos 4-6 Naude's Nek January 2010. 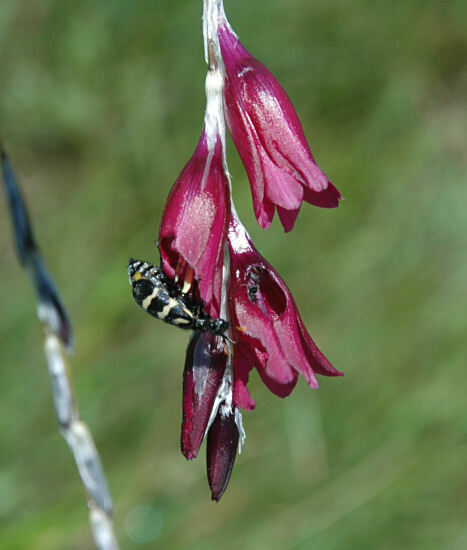 More photos of this species taken in summer in Andriesberg and Waainek in the Eastern Cape by Cameron McMaster. 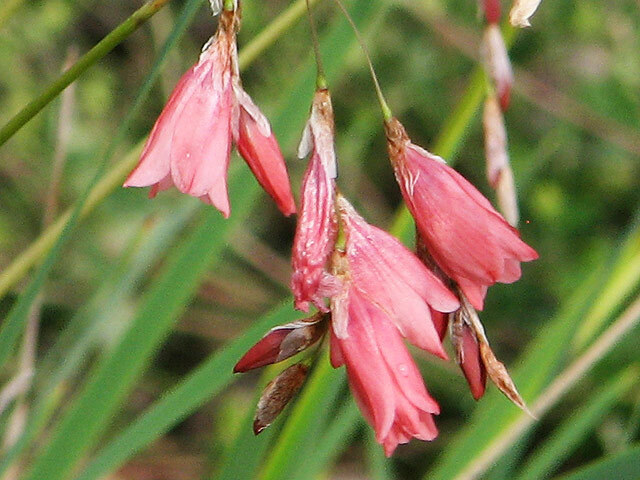 Dierama spp. 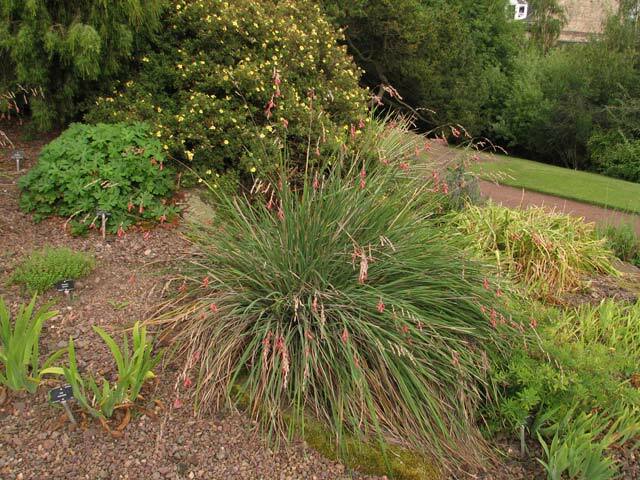 The plants in the first two photos from Jamie Vande were grown from seed from RHS Gardens Wisley and show the first blooming of a seedling. It took 6 years! 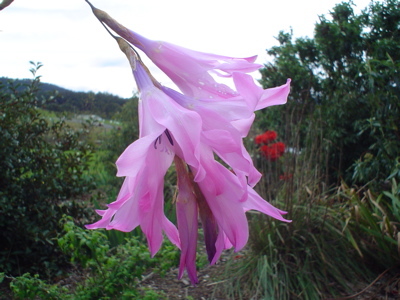 Jamie described it as "a lovely colouring and the inflorescence is approximately 100 cm tall. 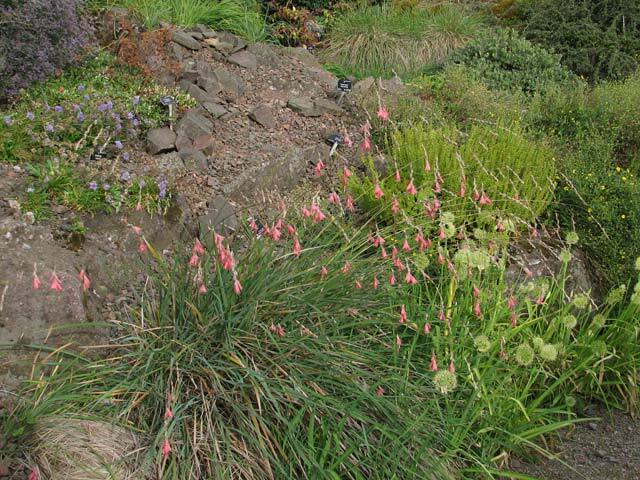 Growing in well-drained soil above my pond, on the rockery." 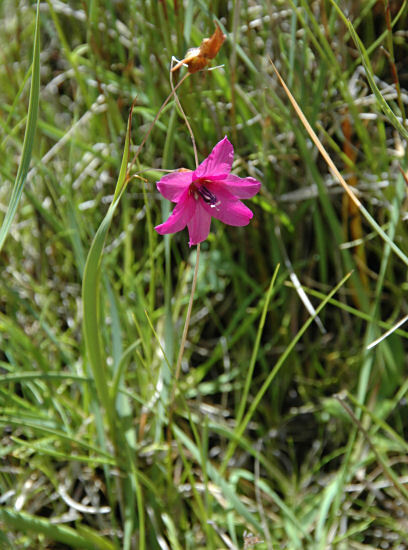 He assumed it was Dierama pulcherrimum but had no resource to key it out and since there are many different species and a lot of them look alike, it is probably safer to label it as an unidentified species. 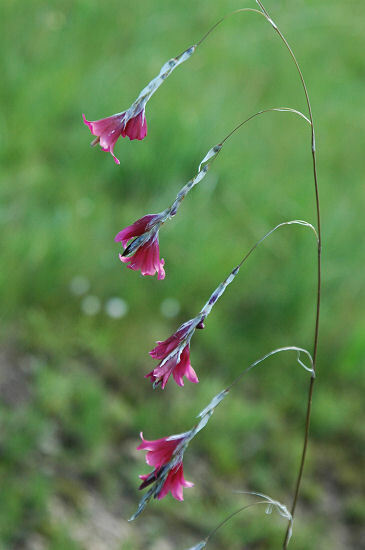 This Dierama sp. 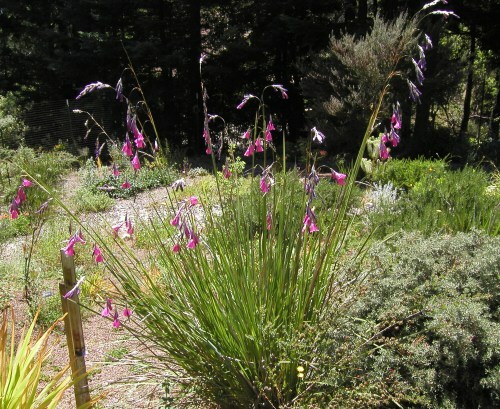 grows well in Northern California where it blooms most years in June to July. It has reseeded in my garden and tolerates a lot of rain in winter and little in summer which is not what it would get in the wild. 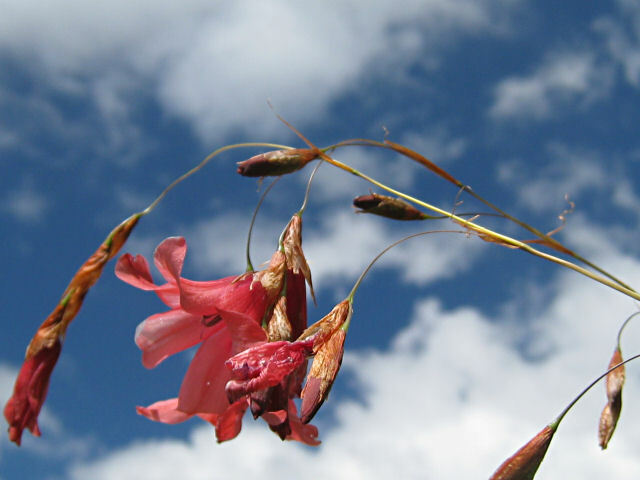 The first two photos by Bob Rutemoeller are of a close-up of a flower and a clump in bloom. I decided to dig out a clump that was no longer blooming I suspected because it was too shady, but also it could have been too crowded. 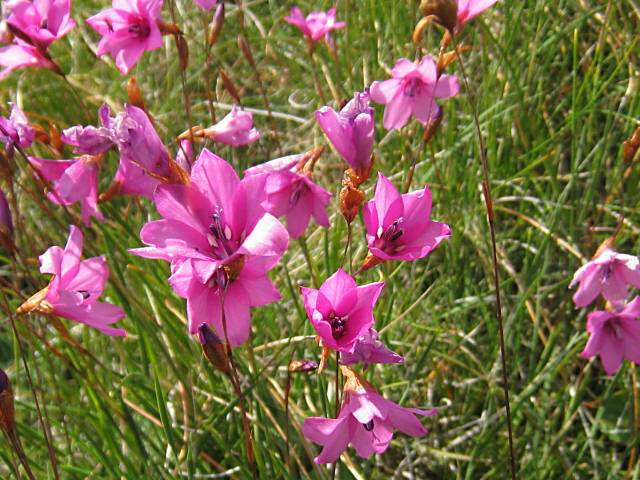 Below is a photograph of the corms. 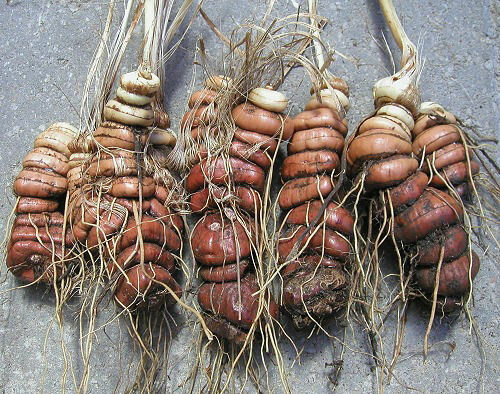 It looks like there are at least ten years of corms and in a couple of instances, they split and two or three more corms were growing on top of the original one. Photo of the corms by Mary Sue Ittner. 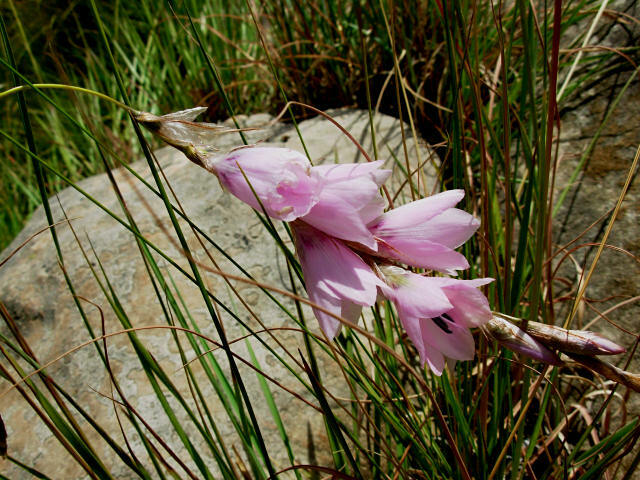 Dierama trichorhizum (Baker) N.E.Br. 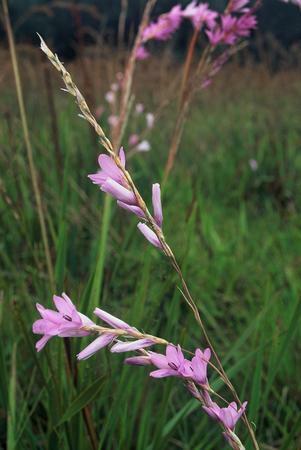 grows in damp grassland in southern and tropical Africa. 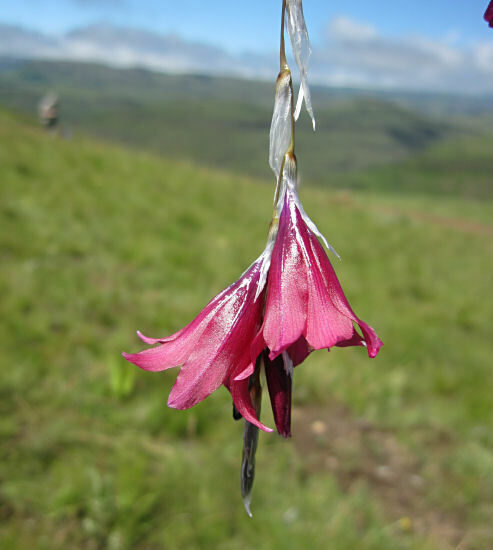 The few flowers are in solitary inflorescences, erect or with 1 to 4 drooping branches, and are pale mauve to light purple. The small bracts are speckled to golden brown. 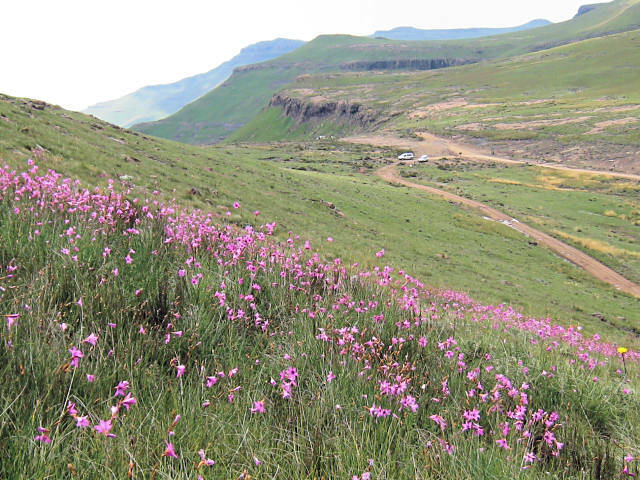 Photos taken at Naude's Nek in the Drakensberg Mountains by Cameron McMaster, Bob Rutemoeller and Mary Sue Ittner. The photos below were taken by Nhu Nguyen of plants in cultivation at the Royal Botanic Garden, Edinburgh. Return to the PBS wiki Photographs And Information page.